We are so glad that God has let your path cross with ours here at Calvary Baptist Church. As a church, it is our desire to Know God, Grow in our Faith, and in the process, Serve everyone. We know that everyone's time is limited, but we'd love to have you come and be a part of what we are doing at Calvary as we seek to minister to our community. This website is full of information that we think will be useful, but if you have any unanswered questions, please don't hesitate to contact us. If you are considering a new place of worship we would love to have you be our guest. 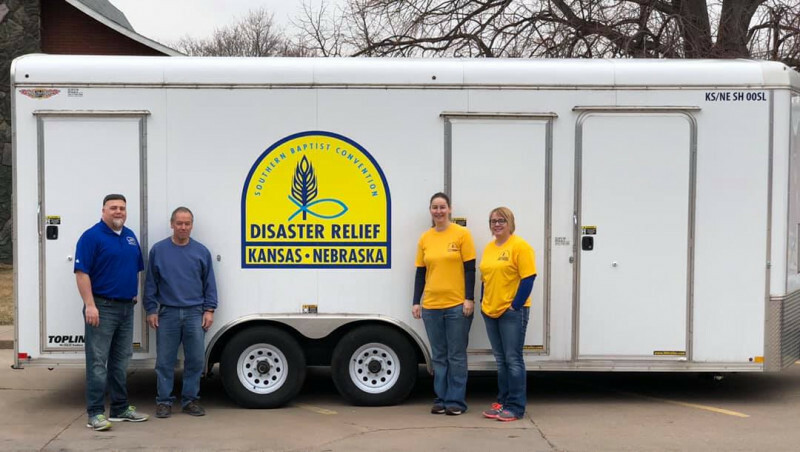 Disaster Relief efforts in Nebraska and Iowa are entering a new phase. Flood Response in Bristow and Lynch in the northeast corner of Nebraska are soon to conclude and transition to Rebuild. Meanwhile, the Flood Response the Fremont, Omaha, and Bellevue areas are picking up steam. We will soon begin the “Big Push” of bringing in lots of teams to do MudOut in these areas in hopes of knocking them out as soon as possible before Tornado Season kicks in. We have discovered that other groups have gone into many homes and did debris removal, and also removed the drywall, but have not done the pressure washing nor the ShockWave treaments. We will be looking to form special crews that will specialize in just the pressure washing and ShockWaving of these homes. Help is still very much needed! Some sad news is that around 290 homes in the Fremont area alone have been red tagged. This means that these homes have been condemned and are not salvageable. What is even sadder is that we anticipate similar red tagging to occur in the Bellevue Region as well. In fact, almost 100% of the mobile homes damaged in the flood will be red tagged. These are people’s homes, and the emotional, let alone financial, loss will be great! It is a mixed situation across the river in Iowa. Waters have receded in the city of Glenwood. Flood Recovery operations begin there this week. The news isn’t too good for parts south of Glenwood, however. The levees are gone. There is no protection from the Missouri River now. Water still stands on the wrong side of the levees, and have not receded yet. The people living in Pacific Junction, Percival, and Hamburg are very discouraged. There is serious talk right now about not even trying to rebuild. Many homes will have to be red tagged. Some have water over their rafters even now. Some have foundations that have caved in. These people desperately need your prayers. I have more bad news to share. This week South Dakota is expecting a blizzard, and most of Nebraska is expecting another blizzard. Precipitation totals could be high if the forecast models prove to be true. This does not bode well for already flooded areas. In fact, it is possible that some areas where the waters have receded could be flooded again. Please pray that the forecast is wrong. To add insult to injury, reports are that the snow in Montana will not be gone until possibly the 2nd or 3rd week of July. IF it melts slowly, this will reduce the impact down river. But, if we get another quick melt, then all bets are off. The Gavins Point Dam on the Missouri River at the border between South Dakota and Nebraska is releasing more water now in anticipation of this snow melt. Again, not helpful for the flooded areas.